The 2017 Women’s VolleyMob National Coach of the Year is Mary Wise, the 31-year head coach for the University of Florida. Wise also took home this year’s AVCA Coach of the Year honor after leading Florida to the National Championship match, a 30-2 season and an SEC Championship. 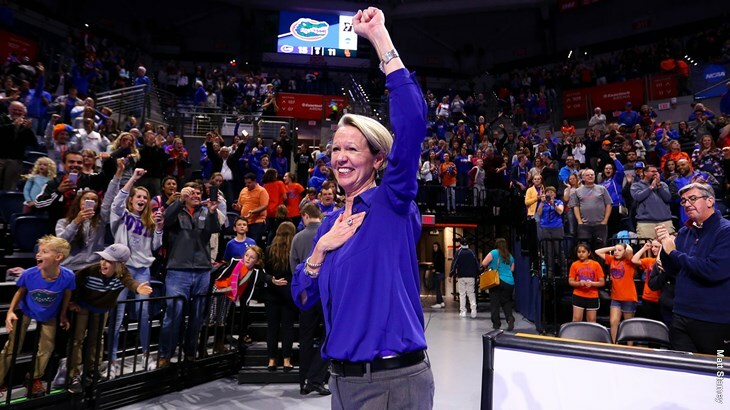 It was the second ever National Championship match appearance for Florida, both with Wise running the program as she was a win away from becoming the first ever female head coach to take the title. She also became the third female coach in NCAA history to hit the 900 win mark earlier this year in late November. The season for Florida, that marked their eighth National Semifinal appearance and first since 2003, came on the outskirts of a 2016 season in which they were upended in the second round of the NCAA Tournament. The Gators also started the 2017 season ranked outside of the top 10 before climbing up the poll and accomplishing many feats throughout the year. The vote was made by eight staff members from VolleyMob, who each listed their top five candidates before the total was aggregated together for the overall results. *Note: Voting was scored with an inverse system where a first-place vote equals five points, second equals four and so on. Tiebreakers broken by who has the most higher level votes.